I was inspired by this post on the MUA NB. I don't have WNW Prancer, so I figured I'd do the gold one instead. 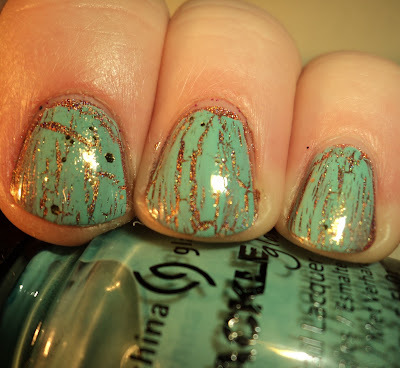 I had on OPI DS Desire and because I can't go 6 hrs without doing something to my fingers, I figured I'd add some crackle (me thinks crackle is the new konad. LOL). Then it still needed something so I added Boom Boom Pow. I love it so much and I will be a little sad when it's gone.